Malaga maintains an ideal central location point between the beautiful Mediterranean Sea and the majestic Malaga Hills. These hills were officially declared a national park in 1989. Creating part of the infamous Costa del Sol are the western coastline cities of Torremolinos; Benalmadena; Mijas; Fuengirola; Marbella and Estepona. Each one is an unforgettable traveler destination spot in its own right. Another great travel destination is the Picasso Museum. The building that houses Picasso’s original artwork has historical roots that date back as far as the 16th century. The Palacio de Buenavista features architectural elements of Andalusian and Renaissance designs that are virtually as impressive as the famous paintings which it holds within its walls. Traveling to the eastern side of Malaga brings visitors to the resort section of the area. One of the most pristine resorts found here is Velez-Malaga. It is set in a fertile valley at the base of the majestic Axarquia Mountains. Just down the road from here is another popular resort Torre del Mar. Both of these resorts remain tucked away among beautiful mountain surroundings. Many travelers fail to make their way towards the east side of the city. Therefore, these beautiful gems often go unnoticed. 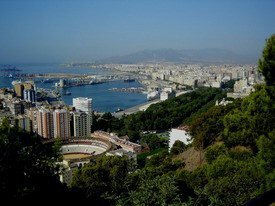 With all of these great destination points to explore, it only makes sense for visitors to enlist Malaga car hire services. Doing so provides the freedom to explore sites of personal interest on an individual schedule. It is one of the only ways to explore the beautiful area of the Costa del Sol without interruption. Malaga Airport is the main location to secure the services of Spanish car hire companies. The airport is approximately 9 km from the heart of the city. Virtually all UK origination points are a two and a half hour flights into the area. Due to increasing popular demand, many car hire service companies become fully-booked very quickly. Therefore, it is highly recommended to make a reservation as soon as initial plans are made to travel to Malaga. By making a reservation ahead of time, great deals can be offered and time spent picking up the car can be reduced. A car hire service opens up the opportunity for endless travel possibilities throughout Malaga. Popular destination spots include Velez-Malaga; Benahavis; Nerja and Mijas. The city of Nerja is a short 39 mile drive from the Malaga airport. Fuengirola is even closer at 21 miles from the airport. Even so, there is one spot closer than all others in Malaga. That is the Malaga city center at a mere 3 miles away from the international airport. Beautiful towns of Andalucia, Seville and Puerto Banus are among destinations that travelers may miss out on if it were not for the choice of using a car hire service. By itself, Seville is home to Alcazar with historical roots that trace back to 913. In addition, there are some peaceful, serene small beaches tucked away along the coastline that are worth a visit. There are simply many breathtaking destination spots in Malaga that make car hire services essential.